Barcelona beat Atletico Madrid in the first leg of their Copa del Rey semi-final tie at the Vicente Calderon. Luis Suarez put the holders ahead with a run from the halfway line before a cool finish. 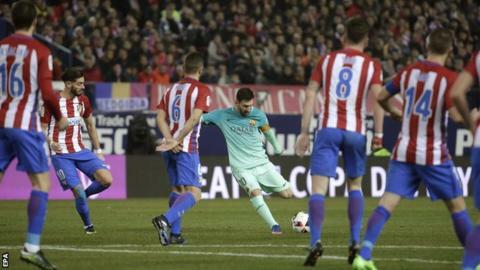 Lionel Messi doubled the lead when his fierce effort from outside the area went in off the post. But Antoine Griezmann gave Atletico hope for next Tuesday's second leg at the Nou Camp with a 59th-minute close-range header. Alaves and Celta Vigo are the other semi-finalists, with their first leg on Thursday.